Bastille are a new indie pop rock band, with a slight electro feel, that have been making waves in the UK over the last year. Originally a solo project and brainchild of now lead singer/songwriter Dan Smith, it has since grown into a band consisting of Smith, Chris 'Woody' Wood, Will Farquarson and Kyle Simmons. 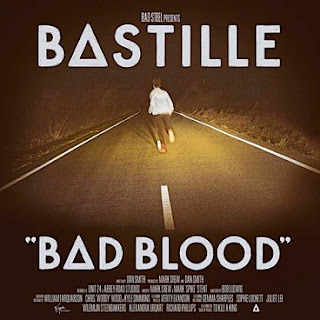 Their debut album Bad Blood has entered the album charts straight at No.1, which is very impressive for a debut, however what should you expect from the album? Firstly the album doesn’t rely on any over produced synth driven production or overplayed guitar that you would expect from an indie rock band. Instead there is a well-crafted blend of pop that is hard to categorise as pop, due to a mix of tracks that have electro dance beats, piano driven melodies, male choirs, string effects and pop rhythms with a indie edge. Yup we told it was hard to categorise! Throw in the tracks lyrics that tell a story of childhood (These Streets), past grudges (Bad Blood), the bible (Daniel In The Den), Twin Peaks (Laura Palmer) and Greek mythology (Icarus) its certain a varied collection of tracks. Smith’s vocals shine on the record, being able to deliver dramatically powerful ballads to electro indie pop edge and everything in-between. The more we listen to the album, we have to salute Dan Smith for the polished product he has delivered. We weren’t sold to begin with, however upon multiple plays, the depth and pop sensitivity Smith has shown, proves why, he and his band, have debuted at number 1. Stand out tracks are title track Bad Blood, current release Pompeii and reportedly fifth single Laura Palmer. You’ll love this if you are a Coldplay fan, however Bastille stand out all on their own due to a quite addictive, infectious and dramatically powerful record. Bastille are currently in Austin Texas at the SXSW Festival, where Dan hopes to grab the attention of US film maker David Lynch who created Twin Peaks, of which Laura Palmer track is in honor, as Smith is a major fan. Bad Blood is available on iTunes now..!